Pictures at an Exhibition (Russian: Картинки с выставки – Воспоминание о Викторе Гартмане, Kartínki s výstavki – Vospominániye o Víktore Gártmane, Pictures from an Exhibition – A Remembrance of Viktor Hartmann; French: Tableaux d'une exposition) is a suite of ten pieces (plus a recurring, varied Promenade) composed for the piano by Russian composer Modest Mussorgsky in 1874. It was probably in 1868 that Mussorgsky first met artist, architect, and designer Viktor Hartmann, not long after the latter's return to Russia from abroad. Both men were devoted to the cause of an intrinsically Russian art and quickly became friends. They likely met in the home of the influential critic Vladimir Stasov, who followed both of their careers with interest. 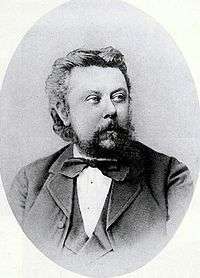 According to Stasov's testimony, in 1868, Hartmann gave Mussorgsky two of the pictures later featured in Pictures at an Exhibition. Stasov remarked that Hartmann loved Mussorgsky's compositions, and particularly liked the "Scene by the Fountain" in his opera Boris Godunov. Mussorgsky abandoned the scene in his original 1869 version, but at the requests of Stasov and Hartmann, he reworked it for Act 3 in his revision of 1872. The years 1873-1874 are associated with the staging of Boris Godunov, the zenith of Mussorgsky's career as a composer—at least from the standpoint of public acclaim. 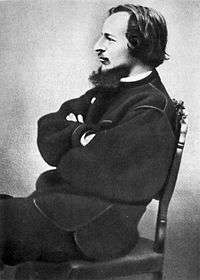 After the performance of three scenes from the opera in February 1873, critic and fellow member of The Mighty Handful César Cui wrote: "...never, within my memory, had such ovations been given to a composer at the Mariinsky [Theatre]." Mussorgsky's distant relative, friend, and roommate during this period, Arseniy Golenishchev-Kutuzov, describing the January 1874 premiere of the opera, remarked: "During the winter, there were, I think, nine performances, and each time the theatre was sold out, each time the public tumultuously called for Mussorgsky." The composer's triumph was overshadowed, however, by the critical drubbing he received in the press. Other circumstances conspired to dampen Mussorgsky's spirits. The disintegration of The Mighty Handful and their failure to understand his artistic goals contributed to the isolation he already experienced as an outsider in Saint Petersburg's musical establishment. Golenishchev-Kutuzov wrote: "[The Mighty Handful's] banner was held by Mussorgsky alone; all the other members had left it and pursued his own path..."
"My dear généralissime, Hartmann is boiling as Boris boiled—sounds and ideas hung in the air, I am gulping and overeating, and can barely manage to scribble them on paper. I am writing the 4th No.—the transitions are good (on the 'promenade'). I want to work more quickly and steadily. My physiognomy can be seen in the interludes. So far I think it's well turned..."
The music depicts his tour of the exhibition, with each of the ten numbers of the suite serving as a musical illustration of works by Hartmann. There was no end to the enthusiasm shown by his devotees; but many of Mussorgsky's friends, on the other hand, and especially the comrade composers, were seriously puzzled and, listening to the 'novelty,' shook their heads in bewilderment. Naturally, Mussorgsky noticed their bewilderment and seemed to feel that he 'had gone too far.' He set the illustrations aside without even trying to publish them. Mussorgsky devoted himself exclusively to Khovanshchina." 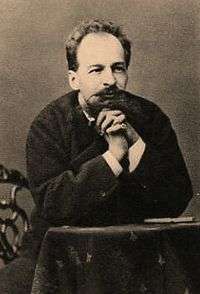 Mussorsky resumed work on Khovanshchina, composing the prelude to Act 1 ('Dawn on the Moscow River') in September, but not before completing in August the last two songs of Without Sun, based on poems by Golenishchev-Kutuzov. As with most of Mussorgsky's works, Pictures at an Exhibition has a complicated publication history. Although composed very rapidly, during June 1874, the work did not appear in print until 1886, five years after the composer's death, when an edition by the composer's friend and colleague Nikolai Rimsky-Korsakov was published. 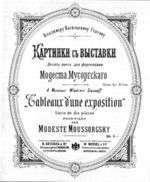 This edition, however, was not a completely accurate representation of Mussorgsky's score, but presented a revised text that contained a number of errors and misreadings. Only in 1931, more than half a century after the work's composition, was Pictures at an Exhibition published in a scholarly edition in agreement with the composer's manuscript, in Pavel Lamm's M. P. Mussorgsky: Complete Collected Works. Note: Mussorgsky owned the two pictures that together inspired No. 6, the so-called "Two Jews". The title of No. 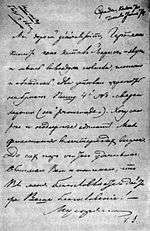 6b, as provided by the Soviet editors of his letters, is Сандомирский [еврей] (Sandomirskiy [yevrey], Sandomierz Jew). The bracketed word 'yevrey' ('Hebrew') is the sanitized form of the actual word in the title, very likely жид (zhid or yid). Vladimir Stasov's program, identified below, and the six known extant pictures suggest that the ten pieces comprising the suite correspond to eleven pictures by Hartmann, with Samuel Goldenberg und Schmuÿle accounting for two. The five Promenades are not numbered with the ten pictures, and consist in the composer's manuscript of two titled movements and three untitled interludes appended to the 1st, 2nd, and 4th pictures (see Pavel Lamm's 1931 edition). The first two movements of the suite—one grand, one grotesque—find mirrored counterparts, and apotheoses, at the end. The suite traces a journey that begins at an art exhibition, but the line between observer and observed vanishes at the Catacombs when the journey takes on a different character. For all the variety individual movements display in musical invention, each springs from a kernel in the opening melody. The Promenade theme provides distinctive "cells" of two and three notes that generate themes and accompaniment figures throughout the piece. Stasov comment: In this piece Mussorgsky depicts himself "roving through the exhibition, now leisurely, now briskly in order to come close to a picture that had attracted his attention, and at times sadly, thinking of his departed friend." Tempo: alternating "Vivo" and "Meno mosso, pesante"
Stasov comment: "A sketch depicting a little gnome, clumsily running with crooked legs." Tempo: "Moderato commodo assai e con delicatezza"
Tempo: "Andante molto cantabile e con dolore"
Stasov comment: "A medieval castle before which a troubadour sings a song." This movement is thought to be based on a watercolor depiction of an Italian castle, and is portrayed in Ravel's orchestration by an alto saxophone solo. Hartmann often placed appropriate human figures in his architectural renderings to suggest scale. Tempo: "Moderato non tanto, pesamente"
Tempo: "Allegretto non troppo, capriccioso"
Stasov comment: "An avenue in the garden of the Tuileries, with a swarm of children and nurses." Stasov comment: "A Polish cart on enormous wheels, drawn by oxen." The movement is cast in through-composed ternary form (ABA) with coda. Mussorgsky's original piano version of this movement begins fortissimo (ff), suggesting that the lumbering oxcart's journey begins in the listener's foreground. After reaching a climax (con tutta forza) the dynamic marking is abruptly piano (bar 47), followed by a diminuendo to a final pianississimo (ppp), suggesting the oxcart receding into the distance. Arrangements based on Rimsky-Korsakov's edition, such as Ravel's, begin quietly, build gradually (crescendo) to fortissimo, and then undergo a diminuendo, suggesting the oxcart approaching, passing the listener, and then receding. Stasov comment: "Hartmann's design for the décor of a picturesque scene in the ballet Trilby." Tempo: "Andante. Grave energico" and "Andantino"
A nearly bar-for-bar restatement of the opening promenade. Differences are slight: condensed second half, block chords voiced more fully. Structurally the movement acts as a reprise, giving listeners another hearing of the opening material before these are developed in the second half of the suite. Many arrangements, including Ravel's orchestral version, omit this movement. No. 7 "Limoges. The Market"
Stasov comment: "French women quarrelling violently in the market." Limoges is a city in central France. Mussorgsky originally provided two paragraphs in French that described a marketplace discussion (the 'great news'), but soon removed them. Stasov comment: "Hartmann represented himself examining the Paris catacombs by the light of a lantern." The movement is in two distinct parts. Its two sections consist of a nearly static Largo consisting of a sequence of block chords, with elegiac lines adding a touch of melancholy, and a more flowing, gloomy "Andante" that introduces the "Promenade" theme into the scene. The first section's alternating loud and soft chords evoke the grandeur, stillness, and echo of the catacombs. The second section suggests a merging of observer and scene as the observer descends into the catacombs. Mussorgsky's manuscript of The Catacombs displays two pencilled notes, in Russian: "NB – Latin text: With the dead in a dead language" and, along the right margin, "Well may it be in Latin! The creative spirit of the dead Hartmann leads me towards the skulls, invokes them; the skulls begin to glow softly." No. 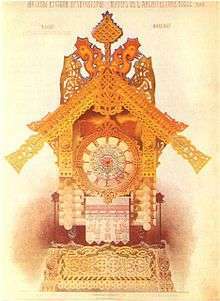 9 "The Hut on Hen's Legs"
Tempo: "Allegro con brio, feroce" and "Andante mosso"
Stasov comment: "Hartmann's drawing depicted a clock in the form of Baba Yaga's hut on fowl's legs. Mussorgsky added the witch's flight in a mortar." A scherzo feroce with a slower middle section. Motives in this movement evoke the bells of a large clock and the whirlwind sounds of a chase. Structurally the movement mirrors the grotesque qualities of "Gnomus" on a grand scale. No. 10 "The Bogatyr Gates"
Tempo: "Maestoso, con grandezza" and broadening to the end. Stasov comment: "Hartmann's sketch was his design for city gates at Kiev in the ancient Russian massive style with a cupola shaped like a slavonic helmet." Bogatyrs are heroes that appear in Russian epics called bylinas. The title of this movement is commonly translated as "The Great Gate of Kiev" and sometimes as "The Heroes' Gate at Kiev." Hartmann designed a monumental gate for Tsar Alexander II to commemorate the monarch's narrow escape from an assassination attempt on April 4, 1866. Hartmann regarded his design as the best work he had done. His design won the national competition but plans to build the structure were later cancelled. The movement features a grand main theme that exalts the opening promenade much as "Baba Yaga" amplified "Gnomus"; also like that movement it evens out the meter of its earlier counterpart. The solemn secondary theme is based on a baptismal hymn from the repertory of Russian Orthodox chant. The movement is cast as a broad rondo in two main sections: ABAB-CADA. The first half of the movement sets up the expectation of an ABABA pattern. The interruption of this pattern with new music just before its expected conclusion gives the rest of the movement the feeling of a vast extension. This extended leave-taking acts as a coda for the suite as a whole. C Interlude/Transition (mezzo forte with crescendo to forte); "Promenade" theme recalled. Suggestions of clockwork, bells, ascent. A Main Theme (fortissimo); tempo Grave, Sempre allargando. The tempo slows to a standstill by the final cadence. The opening bars of Tushmalov's orchestration of Pictures at an Exhibition. The first musician to arrange Mussorgsky's Pictures at an Exhibition for orchestra was the Russian composer and conductor Mikhail Tushmalov. However, his version (first performed in 1891 and possibly produced as early as 1886 when he was a student of Rimsky-Korsakov) does not include the entire suite: Only seven of the ten "pictures" are present, leaving out Gnomus, Tuileries, and Bydło, and all the Promenades are omitted except for the last one, which is used in place of the first. The next orchestration was undertaken by the British conductor Henry Wood in 1915. He recorded a few sections of his arrangement on a pair of acoustic Columbia 78rpm discs in 1920. However, he withdrew his version when Maurice Ravel's orchestration was published and banned every public performance in the 1930s in deference to Ravel's work. Wood's arrangement has also been recorded by the London Philharmonic Orchestra under Nicholas Braithwaite and issued on the Lyrita label. It omits all but the first of the Promenade-based movements and features extensive re-composition elsewhere. Wood's orchestration was once described by Gordon Jacob as "superior in picturesqueness to the Ravel", with its off-stage camel-bells in "Bydlo" and grand organ in "The Great Gate of Kiev". The version by Maurice Ravel, produced in 1922 on a commission by Serge Koussevitzky, represents a virtuoso effort by a master colourist. The orchestration has proved the most popular in the concert hall and on record. Ravel omitted the Promenade between "Samuel" Goldenberg und "Schmuÿle" and Limoges and applied artistic license to some particulars of dynamics and notation. His instrumental colors—a trumpet solo for the opening Promenade, dark woodwind tones for passages suggesting Orthodox chant, the piccolo and high strings for the children's "chicks in shells"—are widely admired. The influence of Ravel's version may often be discerned in subsequent versions of the suite. Another arrangement appeared when Eugene Ormandy took over the Philadelphia Orchestra in 1936 following Leopold Stokowski's decision to resign the conductorship. Ormandy wanted a version of Pictures of his own and commissioned Lucien Cailliet, the Philadelphia Orchestra's 'house arranger' and player in the woodwind section, to produce one. This version was premiered and recorded by Ormandy in 1937. Walter Goehr published a version in 1942 for smaller forces than Ravel but curiously dropped Gnomus altogether and made Limoges the first "picture". The conductor Leopold Stokowski had introduced Ravel's version to Philadelphia audiences in November 1929; ten years later he produced his own very free orchestration (incorporating much re-composition), aiming for what he called a more 'Slavic' orchestral sound instead of Ravel's more 'Gallic' approach. Stokowski revised his version over the years and made three gramophone recordings of it (1939, 1941 and 1965). 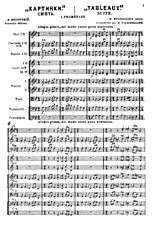 The score, finally published in 1971, has since been recorded by other conductors, including Matthias Bamert, Gennady Rozhdestvensky, Oliver Knussen and José Serebrier. Although Ravel's version is most often performed and recorded, a number of conductors have made their own changes to the scoring, including Arturo Toscanini, Nikolai Golovanov and Djong Victorin Yu. Conductor and pianist Vladimir Ashkenazy has produced his own orchestral arrangement, expressing dissatisfaction with Ravel's interpretive liberties and perpetuation of early printing errors. The conductor Leonard Slatkin has performed 'compendium' versions, in which each Promenade and "picture" is interpreted by a different orchestral arranger. Many other orchestrations and arrangements of Pictures have been made. Most show debts to Ravel; the original piano composition is, of course, frequently performed and recorded. A version for chamber orchestra exists, made by Taiwanese composer Chao Ching-Wen. Elgar Howarth arranged it for the Philip Jones Brass Ensemble in 1977, subsequently recasting it for Grimethorpe Colliery Band. Kazuhito Yamashita wrote an adaptation for solo classical guitar. Excerpts have also been recorded, including a 78 rpm disc of The Old Castle and Catacombs orchestrated by Sir Granville Bantock, and a spectacular version of The Great Gate of Kiev was scored by Douglas Gamley for full symphony orchestra, male voice choir and organ. The Amadeus Orchestra (UK), taking a page from Leonard Slatkin's 'compendium' approach, commissioned ten composers to orchestrate one movement each to make a version first performed complete in 2012. Movements were provided by Alastair King, Roger May, Tolib Shakhidi, David Butterworth, Philip Mackenzie, Simon Whiteside, Daryl Griffiths, Natalia Villanueva, James McWilliam and Julian Kershaw. The suite has inspired homages in a broad range of musical styles. A version featured in two albums by the British trio Emerson, Lake & Palmer incorporates elements of progressive rock, jazz and folk music (1971/2008). An electronic music adaptation by Isao Tomita was done in 1975. A heavy metal arrangement of the entire suite was released by German band Mekong Delta; another metal band, Armored Saint, utilised the "Great Gate of Kiev" theme as an introduction for the track "March of the Saint". In 2002 electronic musician-composer Amon Tobin paraphrased "Gnomus" for the track "Back From Space" on his album Out from Out Where. In 2003 guitarist-composer Trevor Rabin released an electric guitar adaptation of "Promenade" originally intended for the Yes album Big Generator and later included on his demo album 90124. In 2005 Animusic 2 included a track entitled "Cathedral Pictures". Based on the Emerson, Lake, & Palmer version, "Cathedral Pictures" included only the first Promenade and the final two movements from the suite. The Michael Jackson song "HIStory" samples a short section of the Great Gate of Kiev, longer version was played during HIStory World Tour finale in 1997. Re-issues of the HIStory album further changed the sample on the track. Leonard Slatkin Two 'compendium' versions, the 2nd of which he recorded with the BBC Symphony Orchestra for Warner Classics live at the BBC Proms on 1 September 2004; The other recording was with the Nashville Symphony for Naxos Records. An arrangement of "Promenade" is used as the main theme to the British sitcom The New Statesman. During Season 2, Episode 9 of the animated sitcom BoJack Horseman, "Promenade" plays in the background of Princess Carolyn's daydream. "Promenade" is featured as part of the soundtrack to the educational physics game series The Incredible Machine under the title "Pictures (at an Exhibition)". In the 1991 film Cape Fear, the music was heavily influenced by several portions of Mussorgsky's work, although it was credited to composer Bernard Herrmann and reworked by fellow composer Elmer Bernstein. "Promenade" is used in the video game Civilization Revolution as the theme for the trophy room. An arrangement of "The Hut on Fowl's Legs" is used in the video game Catherine as the boss battle music, and was used in the game's pre-release trailer. "Gnomus" is played during the landlord dance recital scene in The Big Lebowski. Three different arrangements of "The Great Gate of Kiev" are used in the anime Rideback. Former wrestlers King Haku and Jerry Lawler used an edited version of "The Great Gates of Kiev" as their entrance themes in WWE. 8-bit Atari computers used the opening bars of "Promenade" in their audio self-test sequence. ↑ Calvocoressi and Abraham (1946, pp. 172–73). ↑ Frankenstein (1939, p. 282). ↑ Parrott and Ashkenazy (1984, p. 164). ↑ "Amon Tobin's Back From Space sample of Modest Mussorgsky and Maurice Ravel's Gnomus". whosampled.com. ↑ "Burning River Brass: Russian Carnival". Retrieved November 12, 2013.